Atrix High-Capacity ESD Safe Shop/Bench Vacuum is designed for durability under intensive use. Electronic line filter suppresses EMI (Electromagnetic Interference) and RFI (Radio frequency interference). 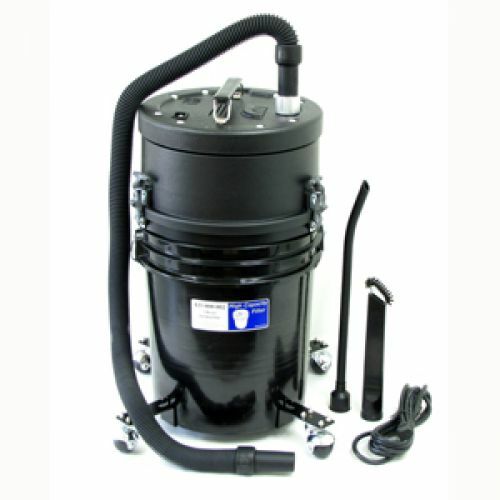 This powerful vacuum is equipped with an extra-large 5 gallon (13 liter) filter cartridge for nonstop collection of large amounts of black and color toner. Cart with ball bearing wheels enables easy mobility, and can be detached when necessary. Full range of ESD Safe attachments includes flexible wand tool, crevice tool with detachable brush, and toner-proof hose that stretches to 10 feet in length.Ideal for recyclers, remanufacturers, and service centers. • Strong/Powerful 1,000 Hour rated Low Noise Motor. • 100% static grounded for safe operation. • Detachable Euro power cord.